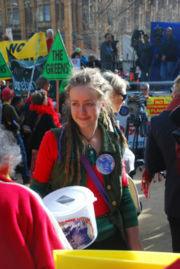 The Climate emergency rally and human sign event was held on Saturday July 5, 2008 in Melbourne, Australia. The rally was organised and attended by more than 50 community groups concerned about lack of government action on climate change. About 5,000 people attended. 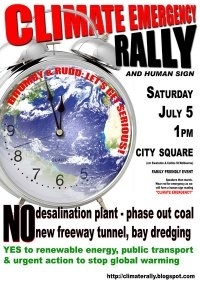 The rally followed yesterday's release of economist Ross Garnaut's draft report on climate change that warned Australia risked losing natural wonders like the Great Barrier Reef and Kakadu if it didn't act now to combat global warning. 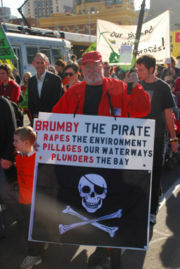 The rally was addressed by Andrea Bolch, Emeretta Cross, Senator Bob Brown, climate change policy analyst David Spratt. "The proposed water factory will emit up to 1.5 million tonnes of CO2 per year; a new power station is being built to power it. It can never be carbon neutral. There are alternatives to securing our water future with a fraction the emissions and a fraction the cost. Three times the capacity of the proposed factory falls on our city and runs into our bays every year. Collect that, and recycle our 2 billion litres of sewerage effluent; that is responsible, sustainable, climate safe water policy." Emeretta Cross, who left the Pacific Island nation of Tuvalu five years ago in search of a better life in Australia, said climate change was seriously affecting island communities. "With the rising sea levels we've got salt water seeping through and it's actually killing off the natural agriculture, she said. "We need to import produce so then it becomes a problem with pollution. It also becomes a health crisis for our people, let alone the possibilities of migrating around the world. Ms Cross, who has a five-year-old son, said it was a "mother's responsibility to teach the children about what they stand to lose. "It is today that we have to do something for our families and our friends both here and abroad. Bob Brown, leader of the Greens, told today's protesters Australia couldn't wait for other countries, including China and India, to act on climate change. "We are one of the most vulnerable nations in the world, he told the rally. "Climate change is a disaster which is on our doorstep. We, in this wealthy lucky nation, must take a lead for the rest of the world to follow. "By 2050 we need a reduction in greenhouse gases by 90 per cent if not a totally carbon-neutral economy. 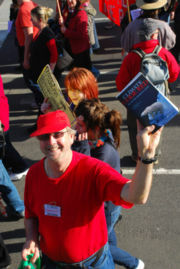 David Spratt, author of Climate Code Red: The case for emergency action, said governments were refusing to act on climate change with the speed and commitment needed. "Today, we actually have the economic and technical capacity to make this change if we have the so-called political will," he said. "The idea of emergency action with as many resources as is necessary is no longer a radical idea, it's simply a necessary idea. The ongoing destruction of Australian native forests, which is creating carbon emissions and reducing city and rural water supplies by over 30 billion litres per year. Support for coal-related projects that will not deliver clean energy and are wasting money and time in the race to address climate change. creating 3 million green collar jobs for the future, to replace those that will be phased out over time in fossil fuel industries. 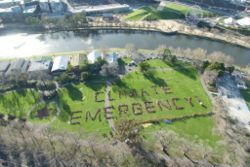 After walking down Swanston Street, attendees then formed a 140-metre-long human 'sign' spelling Climate Emergency in Alexandra Gardens. This page was last modified 01:20, 29 May 2009. This page has been accessed 35,649 times.